Let's talk about thieves in original Dungeons & Dragons & why their so damn important. No its not the dreaded back stab ability but that is a key point to the character class. 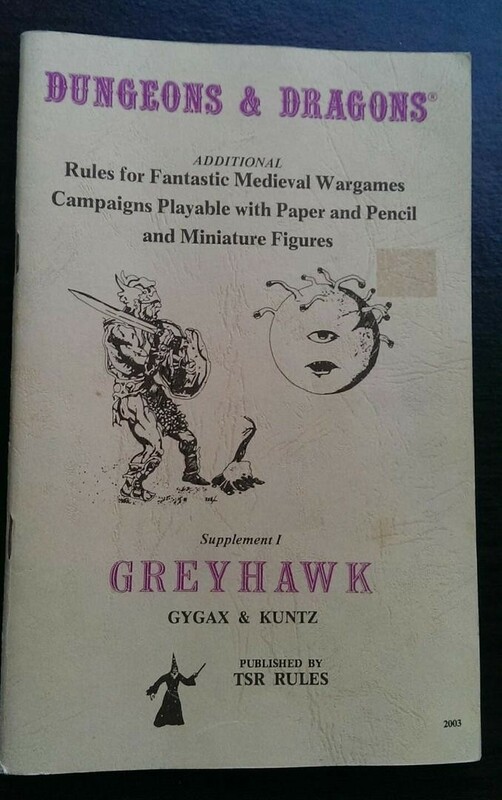 Thieves were introduced in the original Dungeons & Dragons supplement Greyhawk back in 1975. Now according to the 'Rogue' entry on Wiki (by the way I hate the term rogue) the thief class came about from the following; 'D&D fan Gary Switzer shared the idea for a thief class with Gary Gygax over the phone; development was done in Switzer's roleplaying group, primarily by D. Daniel Wagner, one of the writers of the Manual of Aurania, the first non-TSR D&D supplement. The thief class was introduced in the original 1975 Greyhawk supplement. They had 4-sided hit diceunder the new combat system introduced in that supplement'. That's just charming but if we look at the creative origins according to this same entry we find some very Appendix 'N' details; 'The abilities of the thief class were drawn from various archetypes from history and myth, but clear debts from modern fantasy literature can be traced to characters such as J.R.R. Tolkien's Bilbo Baggins, Fritz Leiber's The Gray Mouser, and Jack Vance's Cugel the Clever. In his article "Jack Vance and the D&D Game", Gary Gygax stresses the influence that Vance's Cugel and also Zelazny's Shadowjack had on the thief class.' Yeah that figures but I'm not one to simply stick with the usual word of mouth D&D historical dogma. Thieves are far more useful & desperation motivates the life of an adventurer. This includes the search for coin & the ability to live for more then three or four days at a time. Given Ernie Gygax's fascination nay obsession with Jack Vance I'd say that there's more then a little bit of Jack Vance's Shadow Jack in the mix of our D&D thieves. But given my Sword & Sorcery obsession I turn back to two very interesting sources. 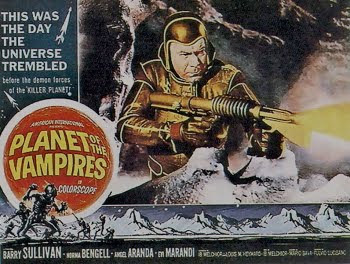 Source one is Clark Ashton Smith's "The Tale of Satampra Zeiros" part of his Hyperborea cycle. Now this story is important for two reasons. Reason one is the fact that we've got a band of cut throat thieves closing in one what they think is the relics of an abandoned temple complex. This temple is far from abandoned. The second aspect of this story that's important is what they plan on doing with any relics they come across. 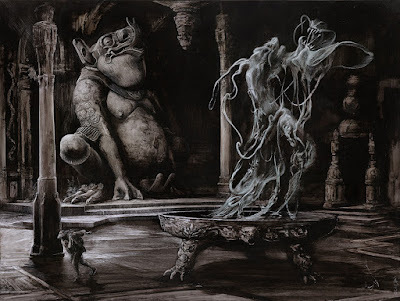 An amazing piece of artwork by SANTIAGO CARUSO that illustrates the scene from the classic story of Clark Ashton Smith's story "The Tale of Satampra Zeiros". Not only does this story have the classic dungeon crawl aspects but it also illustrates quite nicely the supply & demand chain that thieves & wizards have. The path of power is one that demands the services of all kinds of player classes. But it also up points the unexpected circumstances that thieves travel in all of the time. This is the over lap that thieves & wizards have. The low level boots on the ground gritty aspect of the underworld life of the adventurer. The shear circumstances of survival & guts that it takes to be a thief in the world of Dungeons & Dragons. Robert Howard's Conan illustrates this really well in his story. 'The Phoenix in The Sword'. In this story written by written by American author Robert E. Howard, and first published in Weird Tales magazine, in December, 1932. We get the gist of the thief in glorious Sword & Sorcery stereo; Over shadowy spires and gleaming towers lay the ghostly darkness and silence that runs before dawn. Into a dim alley, one of a veritable labyrinth of mysterious winding ways, four masked figures came hurriedly from a door which a dusky hand furtively opened. They spoke not but went swiftly into the gloom, cloaks wrapped closely about them; as silently as the ghosts of murdered men they disappeared in the darkness. Behind them a sardonic countenance was framed in the partly opened door; a pair of evil eyes glittered malevolently in the gloom. "Go into the night, creatures of the night," a voice mocked. "Oh, fools, your doom hounds your heels like a blind dog, and you know it not." The speaker closed the door and bolted it, then turned and went up the corridor, candle in hand. He was a somber giant, whose dusky skin revealed his Stygian blood. He came into an inner chamber, where a tall, lean man in worn velvet lounged like a great lazy cat on a silken couch, sipping wine from a huge golden goblet. Its this classic Conan the treasure supply chain that seems fueled by both desperate circumstances & that powerful need for both gold & bill paying . So the motive for Conan's drive is to merely lead to a path where the power follows the gold. Thieves however are the perfect foils for during adventures for wizards. The wizard's thirst for relics & hunger for forbidden knowledge drives the party of adventurers ever onward. 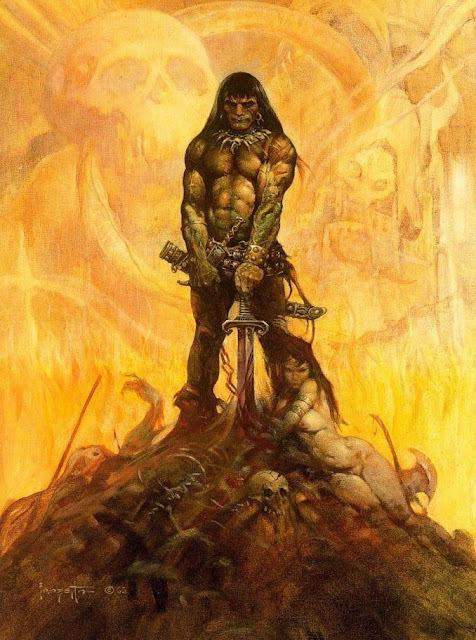 Frank Frazetta's Conan is one of the more iconic & endearing portraits of the warrior & thief that is the barbarian king. Its this quest for gold & glory that drives these games of blood & dust ever onward. The fact that in 2019 we're still talking about it is a testament to the hold that the power of these pop culture myths have on us as players. 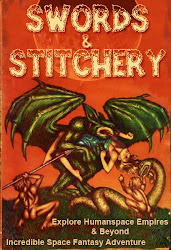 Thieves guilds in Dungeons & Dragons owe Jack Vance's Dying Earth series big time. The fact that they exist suggests no demands that dungeon masters pay attention to the fundamentals of the concept of the thieves guild. They are intricately & elegantly connected with the path of power of wizards or what we as players refer to as the PC classes's level. Thieves are found throughout fantasy literature & their almost always connected with wizards in one way or another. Why?! Because wizards are clients to thieves for many of the books, illicit spell components, pieces of knowledge, relics, & even the occasional monster. 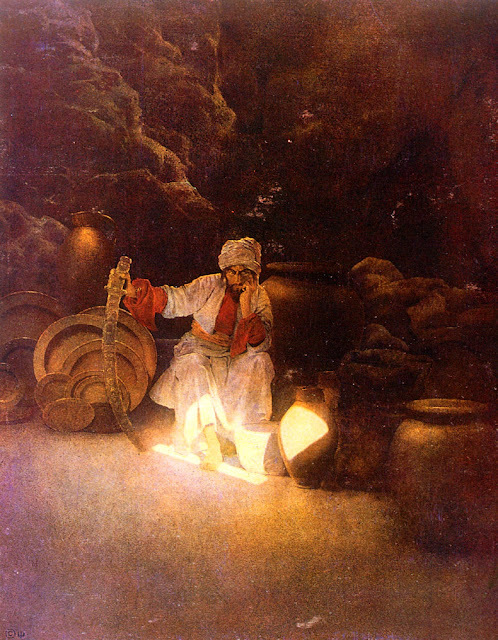 Take for example the legend of Ali Baba ; ' Ali Baba (Arabic: علي بابا‎ ʿAlī Bābā ) is a character from the folk tale Ali Baba and the Forty Thieves (علي بابا والأربعون لصا). 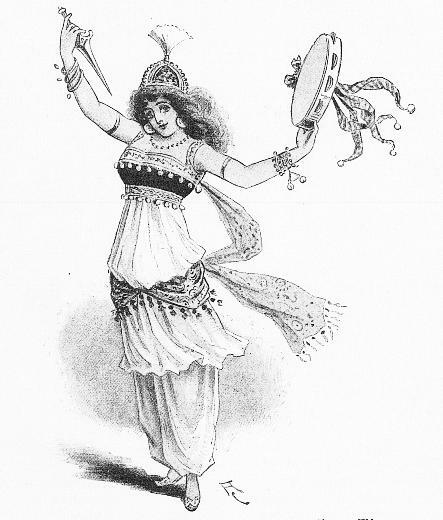 This story is included in many versions of the One Thousand and One Nights, which it was added to in the 18th century by Antoine Galland, who heard the story from a Syrian storyteller, Hanna Diyab. It is one of the most familiar of the "Arabian Nights" tales, and has been widely retold and performed in many media, especially for children, where the more violent aspects of the story are often suppressed. "I'm not talking about the kids version here. So throw out the Alladin & Disneyfied drek here.Ali Baba itself from One Thousand and One Nights, has many of the classic elements of Dungeons & Dragons. This includes the thieves using magic, the thieves cant language including secret symbols & words along with the title character better himself through some very clever trickery worth of any D&D thief. Hell the character of Morgiana, the slave girl could be a bard & sword dancer PC straight out of the Adventurer, Conqueror, King rpg. '"Know, oh prince, that between the years when the oceans drank Atlantis and the gleaming cities, and the years of the rise of the Sons of Aryas, there was an Age undreamed of, when shining kingdoms lay spread across the world like blue mantles beneath the stars — Nemedia, Ophir, Brythunia, Hyperborea, Zamora with its dark-haired women and towers of spider-haunted mystery, Zingara with its chivalry, Koth that bordered on the pastoral lands of Shem, Stygia with its shadow-guarded tombs, Hyrkania whose riders wore steel and silk and gold. But the proudest kingdom of the world was Aquilonia, reigning supreme in the dreaming west. Hither came Conan, the Cimmerian, black-haired, sullen-eyed, sword in hand, a thief, a reaver, a slayer, with gigantic melancholies and gigantic mirth, to tread the jeweled thrones of the Earth under his sandalled feet." Thieves guilds can also be family businesses & again this is something that we see in a wide variety of both Appendix N sources & even older ones. Treasures & relics seem to have an aura of power & tragedy about them. This is evident at the fate of the guild of the forty thieves & several of Conan's poor cohorts over the stories. But many of these remains of a by gone age pass on & into the hands of wizards. Wizards often seem to collect many different treasures from bygone days. Many of these relics are dangerous often handed over to wizards for safe keeping. In modern terms Dr. 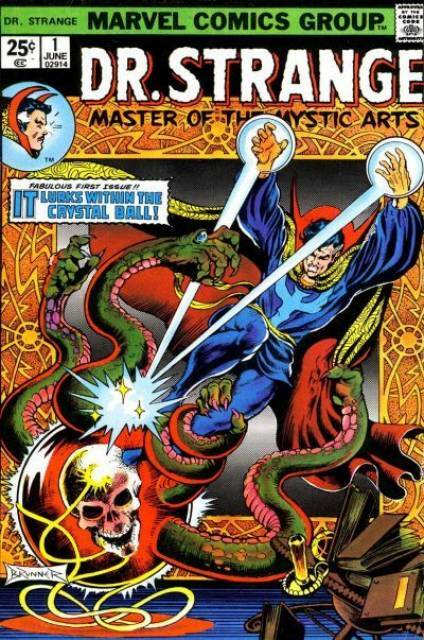 Strange had many relics of power that turned on him later in the series as the writers often used them to convey the supernatural dangers that Strange faced. Many a time was it that I wondered how some of those items had come into his possession. Wizards seem to be prime motivating force for adventurers into dungeons but their not the only ones. As we shall see next time. A silver star climbs up the blue world rim. Send the long ripples wavering to and fro. While to my dreamy soul you whisper low. And now again she comes on star-soled feet. I've drowsed away your Sultan's golden heat. That waft down Cairo's streets when dawn winds blow. Making vague gods of ancient, sea-set trees. Dim gossamer adventures; seas and stars. When sunset minted gold in shimmering bars. When dawn was flinging witch fire on the spars. Here every magic ship on which I ride. More wealth than ever pirate dared to dream. My hammock swings—about the world I rove. Through seas of dawn I sail, Romance abeam.